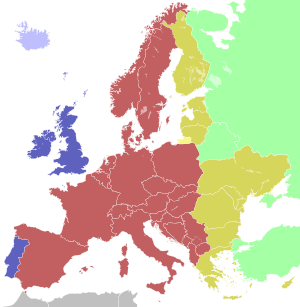 UTC+01:00 as standard time, and UTC+02:00 as daylight saving time, with transition dates according to the European Union rules. The UTC+01:00 centerline (15°E) goes through Bornholm, approximately 2 kilometers from Gudhjem, in the far eastern Denmark, while Copenhagen at 12°34′E corresponds to UTC+0:50, and the west coast at 8°6′E corresponds to UTC+0:32. UTC±0 as standard time, and UTC+01:00 as daylight saving time. The island of Mykines is actually located at 7°36′W longitude and thus at UTC-0:31 (closer to UTC-01:00 than UTC), however Mykines uses the same timezone as the rest of the Faroe Islands. The northeast coast of Greenland. There are a few settlements, like the weather station Danmarkshavn, otherwise unpopulated. The area uses same time as Iceland, since it is generally supplied from Iceland. This is however unofficial. In the summer the time is the same as for East Greenland time. UTC-1 as standard time, and UTC±0 as daylight saving time. UTC-3 as standard time, and UTC-2 as daylight saving time. UTC-4 as standard time, and UTC-3 as daylight saving time, with transition dates according to the United States rules. All of Greenland uses daylight saving time, except for the northeast coast. The transition dates are according to the European Union rules, except for the Thule Air Base which uses United States transition dates and where the below description is not valid. Daylight saving time starts at 01:00 UTC on the last Sunday in March and ends same time on the last Sunday in October each year, simultaneously in all affected areas. This means that in Denmark proper, the transition is at 02:00 local standard time (03:00 daylight saving time), and in the Faroe Islands one hour earlier. In most of Greenland the transition takes place at 22:00 local standard time on the day before (23:00 daylight saving time), four hours before Copenhagen. The first time a common time was used in Denmark, was in 1858, when Copenhagen local time was used as railway time. This was 0:50:20 from Greenwich. In 1880 this time was introduced as a standard time for Denmark. In 1894, Denmark connected to the international time zones, using Greenwich plus one hour. This is the local time of eastern Bornholm, leaving 99.5% of the country west of the time meridian (15°E), which has triggered some sarcastic comments. However all of the country is located east of Greenwich + 0:30 (7.5°E). Daylight saving time was used in the years 1916, 1940, 1945-1948 and is used from 1980. The Faroe Islands introduced Greenwich Mean Time in 1908, and Iceland (then a Danish area) introduced GMT-1 at the same time (changed to GMT, permanent daylight saving time, in 1968). West Greenland introduced GMT-3 in 1916. Daylight saving time was introduced in the Faroe Islands in 1981. Data for Denmark directly from zone.tab of the IANA time zone database. Columns marked with * are the columns from zone.tab itself. This page was last edited on 25 December 2018, at 07:25 (UTC).